Marie or Maria de’ Medici was born in Italy on 26 April 1575 and died on 3 July 1642, and was the second wife of King Henry IV of France and mother of King Louis XIII of France. She was beautiful in her youth, but that didn’t assure a happy marriage. In this 1551 portrait by Agnolo Bronzino shows her wearing an intricate collar with pearls inset and hanging from small v-shaped links. 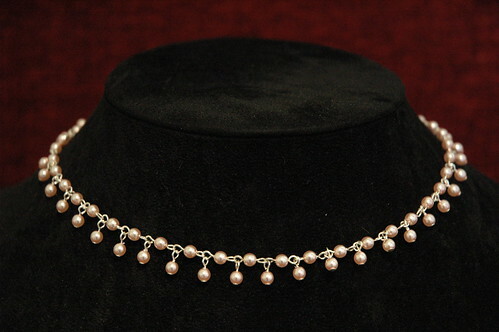 My version is a little simpler – a choker of pearls with a pedant pearl hanging from every link. It can be made to any length, with any colour and size pearl.